Over the last month I’ve added another 135 illustrations to the Book of Traceable Heraldic Art. As with last month, these are drawn from a variety of sources, including some more beasts from Torric inn Björn, some tools and objects from Gustav Völker, and a couple of funky lions from Thomas Wriothesley. Over the winter holidays I took some time to add another 156 illustrations to the Book of Traceable Heraldic Art. Many of these are drawn from the Viking Answer Lady’s SVG Images For Heralds, while others come from historical documents including Insignia Florentinorum (Italy, 16th C) and Opus Insignium Armorumque (Slovenia, 17th C), and some have been newly illustrated for this collection. The Book of Traceable Heraldic Art was in service for its second Pennsic this summer, and hundreds of armory submissions were drawn using images from the new collection. With more than two thousand illustrations, it’s twice the size of last year’s edition. The fifteen binders required to store the print version take up a fair amount of space in the Heralds’ Point art tent, but now that I’ve incorporated the rest of the art from the old Pennsic Traceable Art books, we were able to retire those other binders and reclaim a bit of space. My thanks to everyone who’s contributed art or provided feedback and other assistance over the last year. Key goals for the coming year include fixing problematic images and prominently labeling all no-longer-registrable charges, rounding out gaps in the collection (how do we not have an illustration of an egg yet? ), and adding more illustrations in a variety of styles from period sources and society artists. Drop me a line if you want to get involved! Over three hundred and fifty images have been added to the Book of Traceable Heraldic Art since the November update, drawn from a variety of sources. The set I’m most excited about is the first batch of 94 images from Torric inn Björn’s Heraldic Templates, which was published in 1992 and, as far as I know, is the earliest collection of art distributed specifically to facilitate tracing in construction of society armory. My sincere thanks to Lord Torric for granting permission for these images to be re-published here. This booklet offers far more potential than its 56-page size would suggest, because it contains elements which can be recombined in multiple ways; for example, it contains a few illustrations of deer in various postures as well as examples of various types of antlers that can be mixed and matched together to create stags, elk, and reindeer in those positions. Þórý Veðardóttir has helpfully worked through a number of these combinations, ringing the changes on postures of dragons, wyverns, cockatrices and basilisks. We’ve got dozens more of these images still to process, and I look forward to getting them all online in the months ahead. Another source of new images in this last round has been John Guillim’s 1611 A Display of Heraldry. While its engraved style with extensive shading contrasts with the pen-and-ink outline style used in most society submissions, the images are useful patterns for tracing that (with a bit bit of adaptation) can be used digitally as well, and I enjoy seeing material that dates from so close to our period of study. I’m particularly fond of his Dr. Seuess-ish eel and turkey. I’m also continuing to work through the images from the 2007 Pennsic Traceable Art book, which yields over a dozen heraldic dog postures newly added to the collection this month, and from the Viking Answer Lady’s SVG Images For Heralds collection, which helped fill out some more of the many varieties of heraldic crosses. The further I get into this, the more I realize how much remains to be done, so I’m looking forward to a productive new year as the collection continues to grow. The Book of Traceable Heraldic Art made its premier appearance at Pennsic’s Heralds’ Point art tent this year. I brought printouts of the full thousand-plus page collection with me, which was sleeved into page protectors by the volunteers at the point. 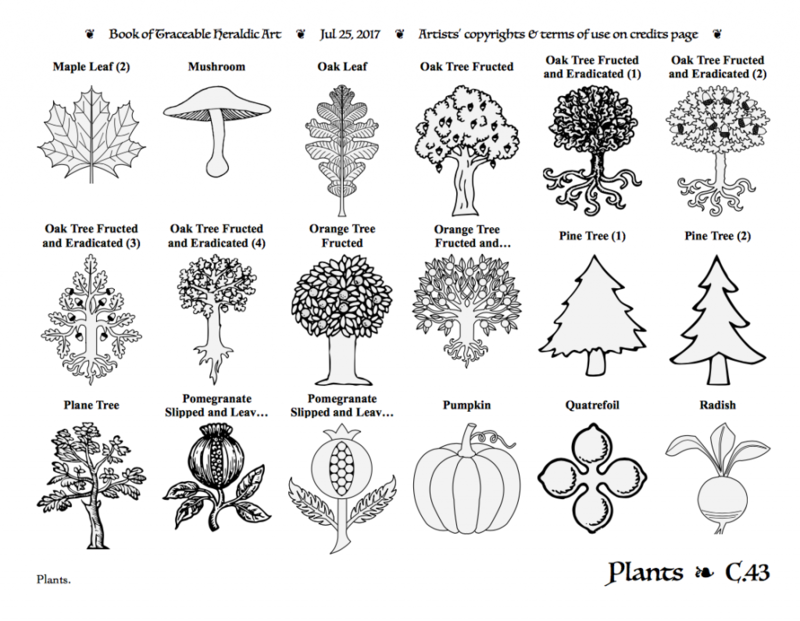 While the new collection is not yet complete enough to retire the old Pennsic Traceable Art book, I was pleased to see that it was of practical use for many of the hundreds of armory submissions generated this year. Throughout the week of activity, the team in the art tent generated useful notes about areas that needed more work, and as the Point was closing up, Signora Beatrice Domenici della Campana and Master Kryss Kostarev took several hours of their time to sit with me and systematically work through the first 430 pages identifying designs which needed correction or could be safely omitted from the version to be used on site next year. I look forward to incorporating that feedback and continuing to expand the collection over the coming year. I’ve continued to add images to the collection, so it’s now over 700 pages of traceable illustrations. I’ve been sourcing more charges from historical rolls of arms, like this key from the Derring roll (c. 1270) and the Schnecke from Siebmacher’s Wappenbuch (1605). There’s a new abridged version available for download that leaves out some of the mirror-image alternatives and artistic variations, producing a PDF with 10% fewer pages for folks who want to have less to haul to events in the field. New “see also” links on some pages lead you to the matching entries in the PicDic and Pennsic Traceable Art libraries, so you can review alternative design options. For the nerdiest folks who might be interested in how the site is built, there’s a new Build Scripts page which explains how a 2,000-line Perl program converts the book’s PDF files into a series of web pages. I’m still working on a process to streamline artists’ contributions of images, but if you’re interested please feel free to reach out and introduce yourself and we’ll get the ball rolling. I’ve finished incorporating the last of the 74 images I received from the Pennsic Bored-Artist Collection. I’ve added a couple dozen more images from historical sources, including Bossewell’s book of 1572 and Guillim’s from 1611. Many more of the items have downloadable PNG and SVG clip art files.